Egypt is inaugurating its largest on-site antiquities laboratory, to restore the second ceremonial boat of Pharaoh Cheops, known for building the largest of Egypt's iconic pyramids. The project, funded by the Japan International Cooperation Agency and the Higashi Nippon International University, is set to complete the initial phase of repairs of the 4,500-year-old vessel by 2020. 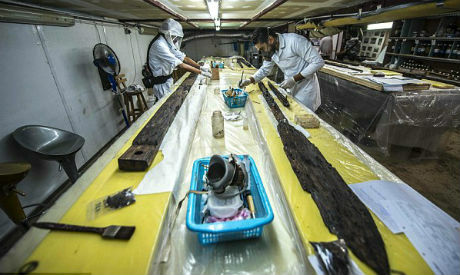 Eissa Zeidan, head of the project's Egyptian restoration team, told The Associated Press that the lab, at the site of the Giza pyramids, was necessary for some of the boat's 1,264 pieces, which are too fragile or large to move. The vessel and its sister boat, on display near the Great Pyramid, were discovered in 1954 and are believed to have been buried with the pharaoh to carry him into the afterlife.